Seven Kingdoms: Ancient Adversaries is a real-time strategy game from Enlight Software, and published by Interactive Magic. It was released in 1998, a year after the original Seven Kingdoms graced the shelves of your local video stores. The man responsible for the game is none other than Trevor Chan, whom you may recognize as the genius behind Capitalism. 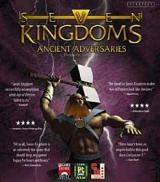 Seven Kingdoms: Ancient Adversaries is little more than a small expansion pack for the original, sold as a stand-alone title. Owners of the original Seven Kingdoms can download a 15 MB patch from Interactive Magic's website to update their game. The patch can also be downloaded from major download centers such as ZDNet. Seven Kingdoms tries to pass itself off as the love child of Warcraft and Capitalism. While this works to a certain extent, it is sorely lacking in too many areas to pull it off effectively. If you were expecting the hybrid game it was supposed to be, it will leave you feeling cheated. None of the complexity and depth of Capitalism are present in Seven Kingdoms.. there isn't even a technology tree. While Seven Kingdoms was busy trying to dress itself up like these other games, it neglected to make sure that the dressing would fit. While there are seven different civilizations to choose from, they all play basically the same. The only difference seems to be the background music and the character graphics. The military of each culture is equally diverse, having only one type of soldier to pick from. If you want to train anything other than a basic soldier, you must build a war factory. Nothing wrong with that, except for the fact that each unit you build (cannons, ballistae, catapults, etc) takes forever to research, then forever to build. The only other type of unit you can use is a supernatural being, and it is unbelievably hard to summon. You first destroy a layer of Frythans. They are evil creatures who live in layers scattered across the map. Upon defeating them you get a scroll of power, which you can use to build a temple. Each scroll is made for a certain people, so if you play as the Normans and receive a Japanese scroll, then you will have to go take over a Japanese town so that you have some Japanese people to worship in your temple. Then, only after ages of worshiping, can you summon this ultimate of creatures, who will be at your beck and call for a limited time. The controls are really easy, having only to use the two mouse buttons to do everything in the game. Drag a square around multiple units to select them. Click on a person, then click on a building to have them enter. Not that you actually get to do that much, because aside from your forts and markets, most buildings have very little interaction to them. If a mine is close to a town, workers will automatically mine ore with no help from you. If a factory is near-by, more workers will refine the ore. Build a market near there, and they will stock the market, and the market will then sell the products to your people and make you some money. The only interaction you have with your markets, is to hire trade caravans. These caravans can have up to three stops, the first obviously being the market at which you hired it. It can then traverse the map and stop at one or two other markets, picking up resources and bringing them back to your market for sale. These other stops can only be at markets belonging to a culture with which you have a trade treaty though, and their caravans will undoubtedly stop at your market as well. Forts are the other main building that has some type of interaction. Each fort can have a general (or your king) and up to eight soldiers. Soldiers start out really weak in this game, and only gain skills by spending a long time in a fort with a general training. Forts should be built next to neutral towns, and the town's resistance will (slowly) decrease, and when it reaches zero the town will submit to your rule. If you don't have the patience for that, there are other ways to gain new towns. If your army is large, you can simply wipe out any resistance. Or, if you have more money than Bill Gates, you can give some to the people of the town to decrease their resistance a bit. The latter should usually be used when the town's resistance is already low (10 or less) so that they can cheaply and quickly be put under your rule. Inns are another building that has some kind of interaction, but not much. The only thing you can do at an inn is hire additional people. The people you can hire are from random cultures and random professions. They are usually trained better than your fresh-from-the-village peasants, but they cost a bit of money to hire. Useful if you, for example, are under attack and need more soldiers. Just hope there are some soldiers at the inn with good combat.. The music is rather bland. It don't get on your nerves or distract you from playing the game. The sound effects are the same way, average at best, but what can you expect from a game that is seven years old? The graphics are slightly below average as well, and after playing the game for a few hours, you will find yourself wishing this game looked more like Age of Empires. There are trees and oceans and things in Seven Kingdoms, but they are mainly there for decorative purposes. Trees cannot be harvested and chopped into lumber, as that resource isn't needed apparently, nor are most others. Oceans can eventually be traveled by water units, but you will find that you never end up having any before the game is over. Before you are able to even build water units, you must research too many other ground units at the tower of science. I suppose this is to make up for the fact that there is no technology tree. The saving grace of Seven Kingdoms is the espionage. You can train spies to infiltrate enemy kingdoms. Once there, they can start lowering the loyalty of the townspeople, or work their way up the enemy's ranks, eventually earning a place next to an enemy general. They can bribe enemy soldiers, who then become spies themselves. They can even try to bribe the general, or assassinate him. The artificial intelligence makes great use of this feature. Many times during a game, you will see four or five spies executed in a single minute. The AI is pretty well-rounded as well. It does a good job of setting up towns, establishing trade routes, destroying Frythan layers, and attacking. I've found that if I leave the Frythan layers alone, and just build up my forces, it is easier to kill off an enemy. Just wait until he finishes wiping out a Frythan layer, when his forces have been slightly depleted, then strike with your full force to wipe out his. There are a few campaigns to complete in Seven Kingdoms, as well as the usual random maps. The multi-player are one of the most fun parts of the game, with the spying and espionage developed so well. There is support for up to seven players via LAN, modem, internet, or serial connection. Overall, I like this game. It is really fun, and when I start a game, I find myself playing for hours. Despite all the down-sides with this game, it is fun and has a lot of replay value. I would recommend Seven Kingdoms to anyone who likes real-time strategy games, as long as you can find it for a reasonable price. I got my copy for $10 at Wal-Mart, so I'm not complaining. If you like Seven Kingdoms, you may also enjoy Warcraft II, Capitalism, Age of Empires, or Majesty. In Mechwarrior, you play a character named Herras. He is a mercenary, who has been training his mech skills for years to take revenge upon the people who killed his family. You find clues scattered throughout the game, and following these clues will ultimately lead you to you to your goal: vengeance. There are basically two parts to the game. In the city menu, you can do things such as upgrade your mech, buy a new one, or sell an old one. You can also buy or sell weapons for your mech, increase or decrease the armor your mech carries, add heat-sinks, jump jets, or your mech's engine. You can also reload your mech's ammunition. Also in the city menu, you can choose new missions to undertake. You can haggle over payment for these missions, or go to the club and try to find some information. The club is where you get the majority of hints as to the location of your family's killers. Each of these locations you will become very familiar with. The graphics in Mechwarrior are really good. Considering the fact that this is a Super Nintendo game, that makes them all the better. The city menu screens used between missions are simple and flat, and very easy to use. The battle graphics are where the game shines though. During each mission, you fly down to a planet's surface, and walk around in 3D style. Mechwarrior then takes on a first-person perspective, and you can rotate the screen in any direction, and even use your jump jets to fly into the air. Let loose a barrage of missiles towards an enemy mech and watch them do damage. Take out an enemy's leg, and watch him stand there unable to move. Take out an arm, and some of his weapons may become unavailable to him. The sound effects are pretty average. Missiles sound like missiles, lasers sound like lasers, nothing to get excited over though. The background music playing in the city menu screen is also average. It's nothing I would care to listen to for a long period of time, but it also never really got on my nerves enough to complain about. Gameplay is easy, there are only a few different types of missions. Garrison duty is the easiest mission, you only have to destroy all the enemy mechs to win. Offensive campaigns and security detail missions are both protect the base type of missions. Recon raid and Objective raid are more like capture the flag missions, each requiring you to seek out and collect a certain item. Controls are pretty basic, being a SNES game. Directional pad moves around, A fires up your jump jets. B fires your selected weapon, while holding it down cycles through firing all of your weapons. Y brings up cross hairs, and X toggles your radar viewer. L and R buttons change which weapon is currently selected. Replay value suffers though. While there are lots of missions available, once you have beaten Mechwarrior, there is little else to warrant playing through the whole thing again. It's plenty fun the first time, but boring after that. For those of you who don't mind cheating, there is an invincibility code for Mechwarrior. Pause the game in the battle screen, and spell out "ALLY ALLY ALLY" to become invincible for one battle. If you want to become invincible for the whole game, you will find yourself doing this many, many times. 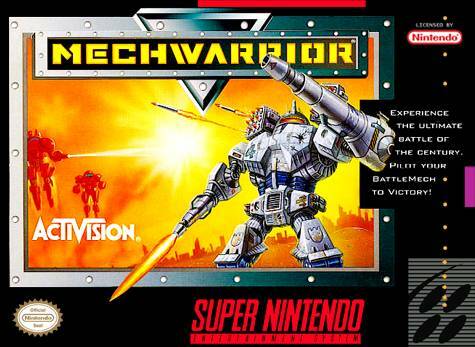 Mechwarrior is a nice addition to any collection, and if your SNES still works, I suggest you give it a try. If you like Mechwarrior, you may also enjoy Front Mission, Battletech, or any of the other Mechwarrior games. 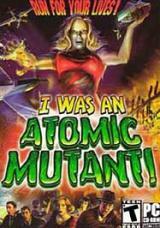 I Was An Atomic Mutant! (henceforth referred to as IWAAM for short) was developed by Canopy Games, and published by ValuSoft. This game was bought for my little brother for his 10th birthday. After I installed it on my computer for him, he played it for an hour or so, experimenting with all four of the different characters; the 50 foot woman, the mutant mind, the atomic lizard, and the alien attack robot. That's right folks, this is a walking, talking, B movie from the 1950's. That's what it was intended to be though. Movies such as Attack of the 50 Foot Woman and Godzilla are the basis on which this game was created. The brief opening movies are grainy black and white "film clips", and so are the movies showing each of the four monsters. The loading screens carry the same effect, boasting Batman-like text and similar sound effects. The words are in spiky circles, or wavy lettering, just like you would expect to see in one of these old movies. So anyway, you pick one of these four killer monsters, and you go wreak havoc upon towns and cities. While the game is pretty much void of any story at all, it don't really seem to even need one. Each of the four monsters has different attacks, but they are all pretty much equal, so that the gameplay is similar regardless of which one you choose. They can all squish, stomp, or smash things, or they can all shoot things from a distance. While your giant lizard may smack things with it's tail, the 50 foot woman will stomp on them. While the alien attack robot may shoot evil death rays at things, the mutant mind will use it's nuclear psychosis. Sound like fun yet? All this is done in a 3rd person perspective, using 3D models (the game uses the Havok engine for this). One minor quirk with this, is that when you try to aim and shoot something straight in front of you, your aiming is blocked by your character. Not that it matters a whole lot with a game this simple. You have a health bar. You have a destruction bar. Simple as that. The purpose of each level is to fill the destruction bar to the top, by destroying buildings, people, cars, tanks, and airplanes. To stop you, the tanks, planes, and military soldiers will shoot at you constantly. It is more of an irritant than a threat though, as you would almost have to purposely let them kill you in order to lose this way. The sound score for IWAAM was also really good. The sound score was done by Michael Wandmacher, who also worked on the soundtrack for the hit movie Legend of the Drunken Master. Controls are simple and straight-forward. Pushing W, S, A, and D will move you up, down, left, and right, respectively. Moving your mouse around the screen works to aim, and pushing the left button uses whatever attack you have selected. If you have a wheel mouse, the wheel provides a quick way to switch through the four different attacks. There is a patch available from ValuSoft's website, to bring the game up to version 1.10. This fixes some render and playback issues on some graphics cards. It also enhances the AI of the "puny humans", and adds 3 new camera views, so make sure to download the patch. 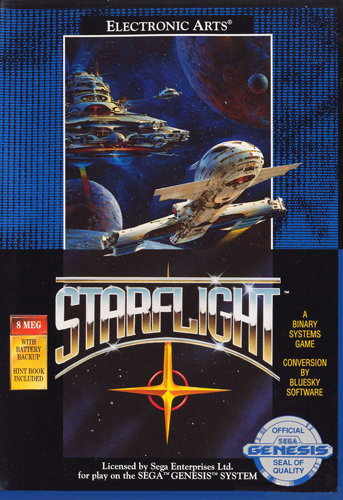 I actually tried this game on two computers. It wouldn't play on my old computer, because the old built-in graphics card only had 4 MB of VRAM, and IWAAM wouldn't display any graphics in software mode. It does work fine on my main computer though: Athlon XP 2200 , 512 MB RAM, 52x CD-ROM, GeForce 4 MX 440, 64 MB VRAM. Overall, this game was slightly better than I had expected, but not much. There is really no replay value at all. It may keep you occupied for a half hour or so, then a couple months from now you may play it for another half hour... but not enough to bother keeping it installed on your computer. Keep in mind that this is a budget game though, so it was well worth the small price tag, even for an hour's worth of gameplay. If you like 3rd person shooters, or if you feel in the mood to re-live a 1950's B movie, then you should try this game. If you like I Was An Atomic Mutant!, you also might want to try Godzilla or War of the Monsters.